UD visits Yas Waterworld waterpark in Abu Dhabi! 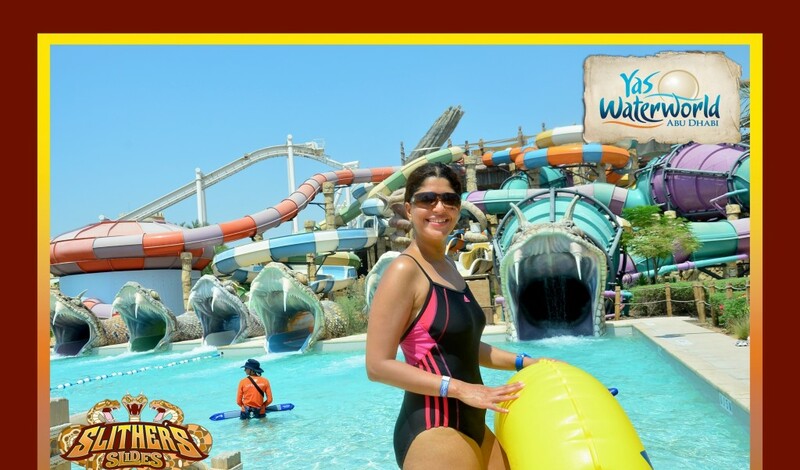 I can’t believe it took me this long to visit Yas Waterworld waterpark in Abu Dhabi! I think the main reason was the fact that I don’t drive, and so the idea of venturing out of the city requires some sort of planning and transportation arrangement. The best part was that I got to spend my Friday doing something completely new, fun and exciting! Plus, being an outdoorsy person and a cancerian, means that walking around barefoot on grounds made cool with water sprays and splashing in water for a full day is my ideal definition of the word leisure! The park is open from 10 am to 7 pm daily. And there are clear directions for how to get there on the waterpark’s web site. 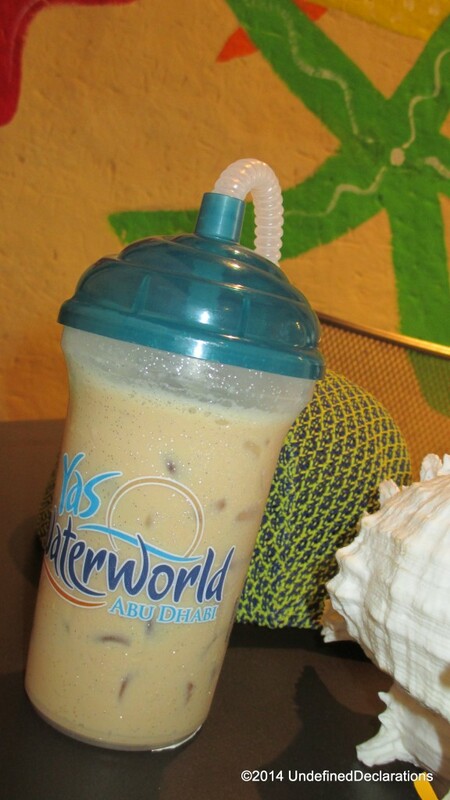 UD is excited about visiting Yas Waterworld! What’s unique about this waterpark? Yas Waterworld is not your ordinary waterpark. 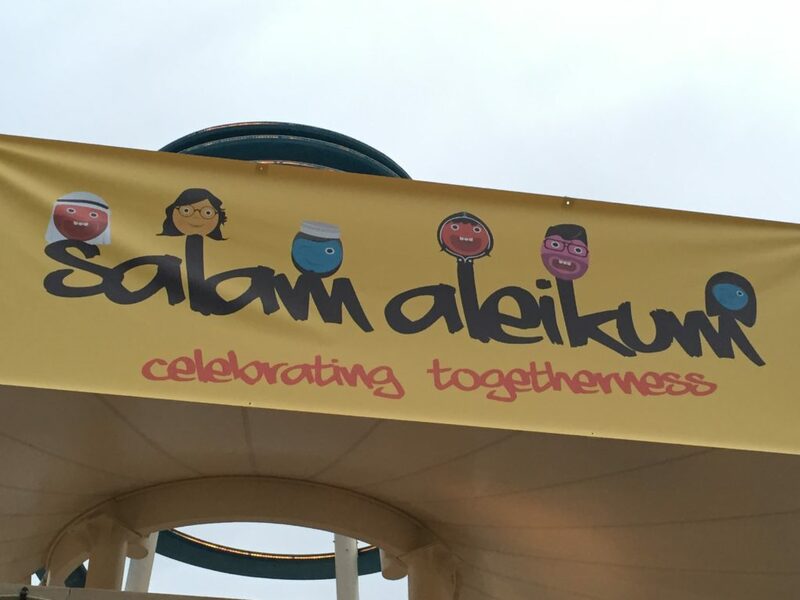 It’s a waterpark with an Arabian theme and concept. There are water sprinklers on most of the spaces in the park. 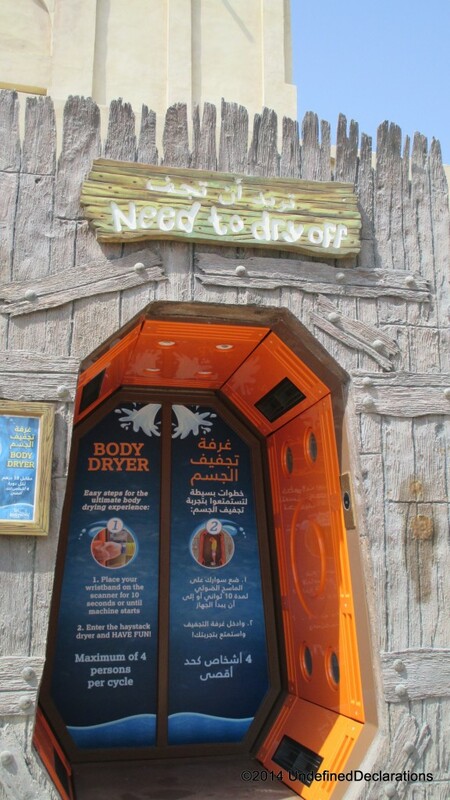 So you don’t have to worry about walking barefoot in the UAE summer heat. There are even members of staff spraying water on you at different locations – just to cool you off while you walk to your next ride. There are professional photographers scattered around the park to take your picture in the water, in front of the slides, or even at the roller-coaster ride. There is underground irrigation, which helps keep the ground cool at all times. This makes it easy to walk without flip flops throughout the park. There are dance competitions for kids with passes as giveaways. There was a pearl diving show for both adults and kids. Which is great for expats to learn about the pearl diving culture and heritage in the region. There were performers all across the park on the day I visited. As it was the first day of the start of the 100 family days – an event which will go on until the end of the year. The park has a wide range of food and drink options. The ice-cream is not to be missed! super delicious! There are different levels of the rides. So whether you just want to slide down a river in a floater or go down a vertical drop slide, there’s definitely something for everyone. There’s a good number of rides and activities for kids too. 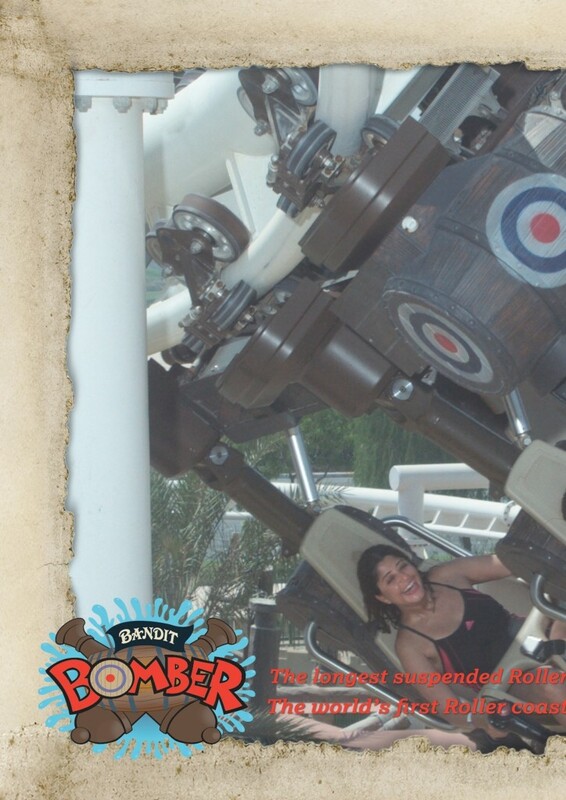 The Bandit Bomber is a super cool roller coaster ride – only more fun since you’re in your swim wear! This ride gives you a full tour of the waterpark with crazy detours and turns that will blow you out of your mind 😀 in a good way though….it’s also very breezy up that ride! Sun loungers scattered all around the park and at the area by the “beach” pool. DJ playing cool tracks near the “beach” pool. Waterfalls, water splashing at you from random places, and all sorts of water park fun. Friendly and helpful staff. The general atmosphere at this waterpark is highly positive and refreshing. Everyone is happy to be there and to do their job at their best level. Professional picture taking – you can choose to buy your photos at the end of the day. I had mine saved on a USB stick. Good way to stay fit in a fun and cool environment. Great options for food and drinks. I must try the coconut drink at my next visit. The quality of the food was excellent too. A range of activities and things to do for kids. As well as exciting competitions. Events for families. The “100 family days” event will go on till the end of the year. But there will also be other events throughout the coming months. Upcoming events include: festival of lights, music events, and winter activities. 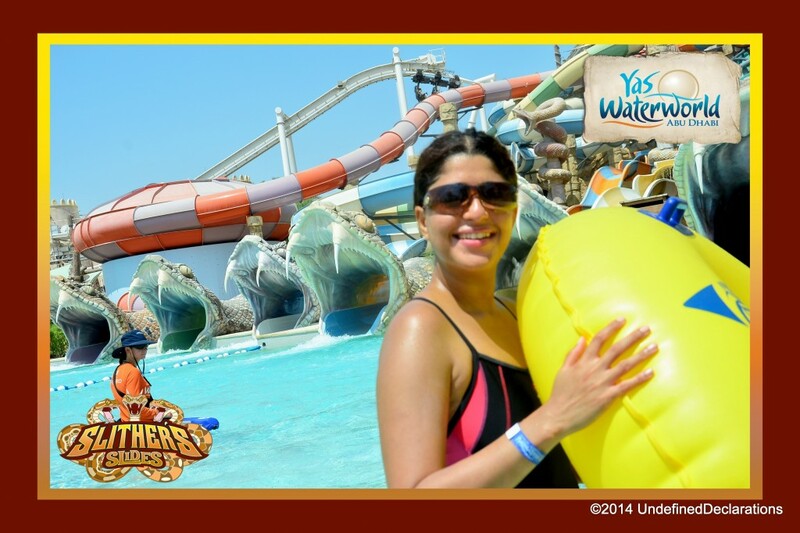 I honestly woke up with an unusual high the next morning after my Yas Waterworld adventure! I guess it was the adrenaline rush from going on all those fun and exciting rides. I think everyone should head out to this original and vibrant waterpark every once in a while. It’s a truly refreshing and invigorating way to spend a Friday. One that’s suitable for the whole family too. Everyone from the babies to the elderly and all ages in between were having a blast at this cool waterpark. 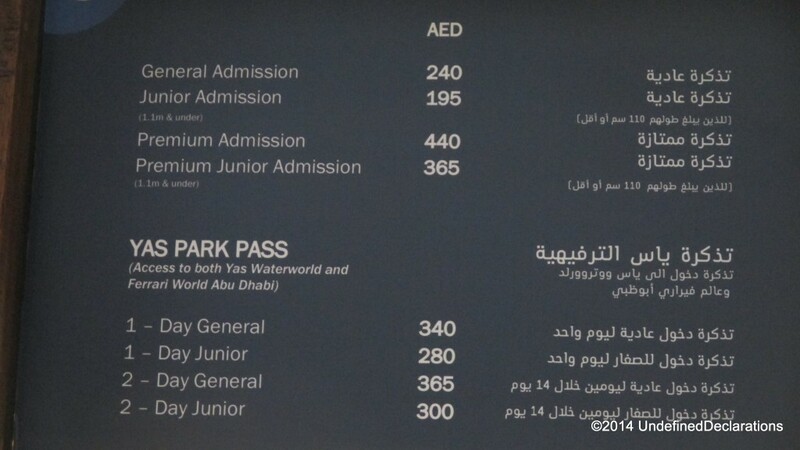 Note: If you’re visiting the park on a weekend, you might want to go for the premium admission passes. The premium admission tickets allow you to access the rides through the fast lane/track. This means that you will avoid waiting in the long queues for some of the popular rides on a Friday. For more information, check out Yas Waterworld’s web site or Facebook Page. Gourmet Food, Sun and Live Music! Taste of Dubai is a fun outdoor festival revolving around food and music. 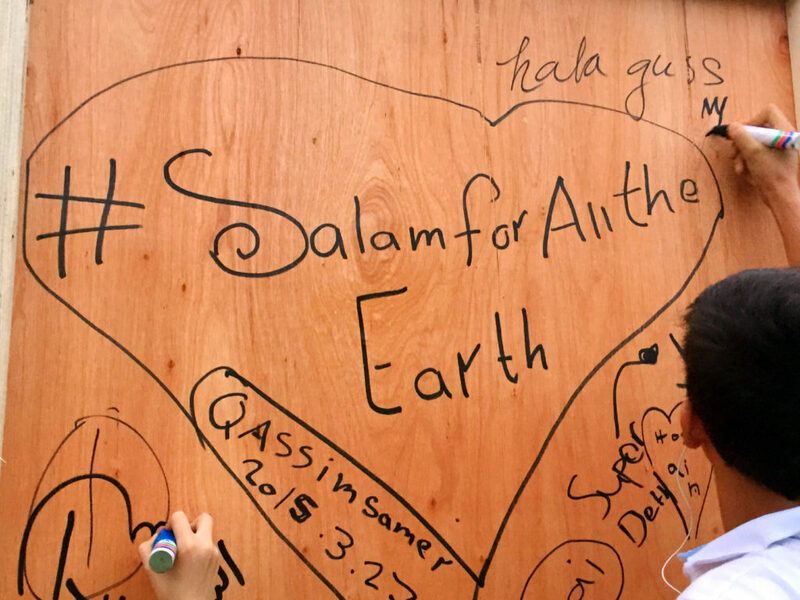 It’s held annually at the Dubai Media City Amphitheater; the same area where the Christmas festival took place and I wrote a post about it here. 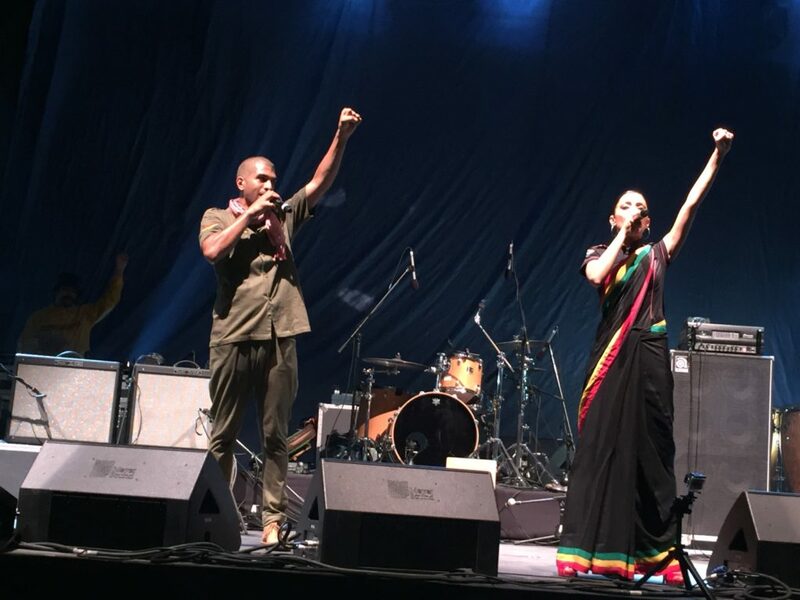 It was a Friday, and on that day the festival started in the morning and went on until midnight. I didn’t have a set time as to when I would go, but I was glad that I went during the afternoon (around 4:30) and stayed till around 8:45 in the evening. I was also thankful that I put some sun protection cream on my arms before heading out, because it was sunny and the sun cream did help me get a nice tan. I would have to say that my favorite dish was the sirloin steak with potato gratin from Seafire steak house. It was perfectly made and tasted so good. The other steak I had from Ruth’s Chris steak house was kind of average. Maybe the combination of crab cake with the red meat didn’t appeal to me that much. And although the seafood Phad Thai from Mango tree was good, I must admit that I did regret filling my stomach from their stand, mainly because I had recently eaten there with my dad a few weeks back. And so, a better choice for me during the festival would have been to sample other restaurant’s dishes. Especially the ones that I don’t get the chance or time to dine at on normal occasions. When I saw that there was a Mexican stand after I had already had my mains and desserts, me and my friend decided to try out Maya’s (the famous high-end Mexican eatery) guacamole. Which we both thought was surprisingly below average. With prices ranging between 20 to 30 Dirhams for most dishes, I would say that Taste of Dubai is worth visiting if you love food and don’t mind paying that amount of money for a small portion from a high-end, gourmet restaurant. The main attraction of the festival, well to me at least, had to be the opportunity to sit outside in a park-like atmosphere with the company of good friends and great live music. Posted on March 18, 2013 Author Nada Al GhowainimCategories Dubai, Events, Festivals, Food, Live Music, ParksTags Asado, Dubai, Dubai Media City, Events, food, food festival, food tasting, gourmet restaurants, live music, Mango Tree Dubai, Maya Mexican Dubai, outdoors, park, Ritz-Carlton, Ruth's Chris Steakhouse, Seafire Steakhouse and Bar, Taste of Dubai 201343 Comments on Gourmet Food, Sun and Live Music! My Hong Kong Trip – Day 6: The Famous Peak, Kowloon Park, and my Low-key NYE! I arrived to the Peak Tram Station at around 10:30 in the morning. To my surprise, the queue for the ticket window extended all the way to the street. So you had to walk for some time to figure out where the line ends so you could join it. As we all waited and slowly advanced in line, some of us were getting coffee from the nearby café or waiting in a shaded area until their family members or friends got closer to the ticket counter. It was a sunny yet windy day. Luckily, I was wearing a winter hat that day and was able to get some shade from the cap attached to my hat. When I finally reached the beginning of the tram line, it was already 1 o’clock! There was some sort of fight to get on the train, and there was no one organizing the order by which people boarded the cable car. This led to a lot of chaos and rude looks and comments from other tourists. To be honest, I was greatly disappointed by what I saw when I made my way up to the sky terrace. Which is the highest level that you can reach to see the Victoria Peak. Let me make it more clear; I personally didn’t think that the view was worth the two and a half hour wait to take the train! What you would see basically was the Hong Kong city sky line that includes the sky scrapers and modern high-rise buildings. In addition to the green natural surroundings of the area. To me, it wasn’t a view to die for. Maybe I had seen more beautiful natural and artificial views in my life. Having lived in Leysin, Switzerland at an extremely high altitude where I could literally see the clouds beneath me from my dorm room terrace, I wasn’t the slightest bit amused by the Victoria Peak view. Nevertheless, having waited all that time to get up here, I had to snap as many pictures as I could. And of course ask random people to take my picture as well! But the drama doesn’t end here. I was surprised to find another queue greeting me at the station to take the tram back to the ground level. Thankfully, it was only a twenty minute wait this time. I was delighted to exit the Peak madness and go back to Kowloon for my next attraction for that day: Kowloon Park. There’s a beautiful bird sanctuary with colorful and pretty birds, a statue garden, a small maze and an observation deck. Crossing to the other end of the park takes you to the Harbour City area. Where a large shopping mall with the same name would be a good place to spend a few hours. More so if you happen to visit during the holiday season, when all the sales are on. Since shopping wasn’t a concern for me at this particular trip, I opted for a soup dinner. Finding non-authentic Chinese food in Kowloon is like finding water in the desert! I couldn’t believe my eyes when I saw a salad and sandwich place. But my greed and curiosity made me decide to look around the mall for something better. Before returning to that shop an hour or so later only to find out that they are closing early because it was the 31st of December. So all I could have was what was left of the soup of the day. It was a soup with shredded chicken. And let me tell you this: I have never had soup with such a huge appetite in my life! It had been a few days since my stomach ache and I had to go on a strict diet of bananas and yogurt. So for me to actually find a place that serves healthy western-type food and to be able to taste some real food after my days of starvation, was a real revelation. It was almost time for the year to end. I was a few hours away from the new year. I was in Hong Kong; the city of lights. And my hotel was within walking distance from Victoria Harbour. So you would think that I wouldn’t think twice about going to the harbour to see the fire works that night? Well you are absolutely wrong! I can’t recall how many times I have changed my mind back and forth about going alone to the harbour to see the New Year fire works! Mainly because my local friend had warned me about the extraordinary crowds and the long hours it would take me to get back to my hotel if I decided to go to the harbour. As much as I didn’t like the idea of being stuck in the NYE crowd and the abnormally busy streets of Kowloon, I knew that I didn’t fly all the way from Dubai to Hong Kong during the holiday season to spend my New Year’s Eve at the hotel. So I gathered all the courage in the world (or Hong Kong for that matter would be enough since it’s such a busy city) and headed out of the hotel – after asking the reception staff if it would be a great risk for me to go out to the streets on NYE – and made my way to the legendary Victoria Harbour. The streets were closed off so that people could walk in them and take pictures. No cars were allowed to go through the streets for the night. We had to take different routes to get to the harbour. When I finally got there, I found out that the area where the fire works would be taking place was closed with barriers, and police officers were standing on the spot. It was around 10:30 pm and the area was already packed with the New Year celebratory crowd so they weren’t letting in any more people. Looking at the time and thinking if I really wanted to hang around for a couple of hours and possibly get stuck in the crowd when it was time to go back to my hotel, I decided to make a wise decision and call it a night and walk back safely to my hotel. On my way to the harbour, I did get to witness an Indian community group parade, local teenagers in New Year costumes and accessories, a young band performance, and almost everyone having their picture taken in the middle of the closed down light-filled streets. While I didn’t get to celebrate or ring in the new year in Hong Kong style, or attend the hotel’s NYE dinner party which I found out about the next day, or watch the world-famous fire works at Victoria Harbour (or even on TV! 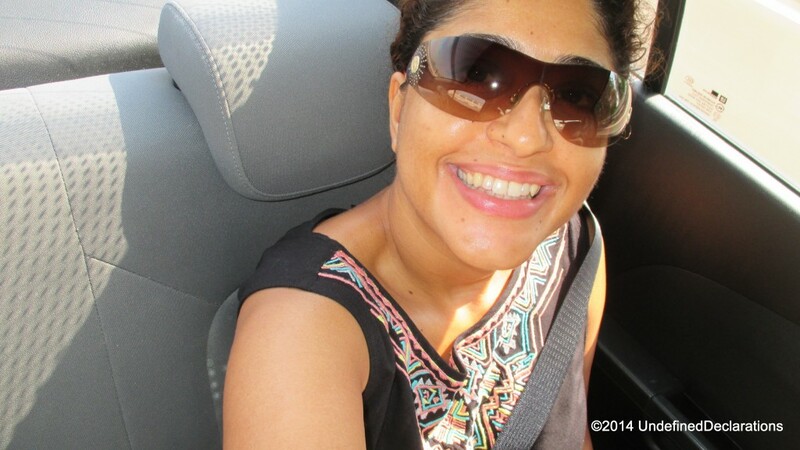 ), I am grateful for the many privileges that I have in my life. One of them being the opportunity to visit a far-eastern country for the first time, and experience the thrills associated with exploring a new destination and culture. Although I am almost two months late, but I would still like to wish all of you: A very happy and adventurous new year! Posted on February 25, 2013 Author Nada Al GhowainimCategories Hong Kong, New Year's Eve, Parks, TravelTags Celebrations, December 31, Fire Works, Harbour City, Harbour City Mall, Hong Kong, Kowloon, Kowloon Park, New Year's Eve, Peak Tram, The Peak, Victoria Harbour, Victoria Peak51 Comments on My Hong Kong Trip – Day 6: The Famous Peak, Kowloon Park, and my Low-key NYE!